The US Census Bureau released on September 13 this year’s editions of three reports which normally come out at about this time: Its report on Income and Poverty in the United States, its report on Health Insurance Coverage, and its Supplemental Poverty Measure report, which provides figures on poverty when government transfer programs are taken into account. They all cover the period through 2015. The reports show exceptionally strong improvements in a range of measures of income and well-being. To start, real median household incomes rose by an estimated 5.2% in 2015. There has never before been such a large jump in real incomes since this series first started being reported in 1967. Perhaps more importantly than the overall gains, the Census Bureau data also show that the gains were widespread across income groups (with the poorest 10% decile in fact seeing the largest gains) as well as across race and ethnic groups. It was not only the rich who saw an improvement. I should hasten to add that these results are from just one year, and that they follow far less satisfactory results over the last several years. Real household incomes plummeted in the 2008 downturn in the last year of the Bush administration, and were flat or fell further in most years since. It should also be recognized that the Census Bureau figures are based on household surveys, and thus that there will be statistical noise (as the Census Bureau emphasizes). It remains to be seen whether the positive news will continue. But with labor markets now at or close to levels generally considered to be full employment, and with real wages now rising, it is likely there has been an improvement also in 2016. But we will only know a year from now what the survey results will be. The Health Insurance Coverage report found that health insurance coverage also improved significantly in 2015, as it had also in 2014 but importantly not in the years before. The big change in 2014 was of course the coming into effect of the Affordable Care Act (ACA, or ObamaCare) reforms, with the introduction of the market exchanges on which the previously uninsured could purchase insurance at a reasonable price, as well as the expansion of Medicaid coverage in a number of states (but not all). There are now over 20 million more Americans who have health insurance coverage than had it in 2013, before ObamaCare went into effect. Not surprisingly, the reports received a good deal of news coverage. It was the lead front page article of the Washington Post the next day, for example. Not surprisingly also, the White House released a summary of some of the key, highly positive, findings. But while the news reports focussed on the strong income gains, and many also noted the health insurance gains, I have not seen a chart such as that above which shows the gains in historical context, and with the Medicaid expansion states and non-expansion states shown separately. This post will discuss that chart and what is going on behind it. The chart above shows the percentage share of the population without health insurance coverage in each year from 2008 to 2015, with this shown separately for those states where Medicaid was permitted to expand (27 states plus Washington, DC, with the status taken as of January 1, 2015) and for those states that did not allow Medicaid to expand (23 states). The figures were calculated from the underlying data tables (the “HIC” series) used in the Census Bureau Health Insurance Coverage report. The data series used here comes from the American Community Survey (ACS), which has an extremely large sample size which permits a meaningful state by state breakdown. It asks whether the individual was uninsured at the time of the interview. The Health Insurance Coverage report also presents figures at the national level obtained from a different survey called the Current Population Survey – Annual Social and Economic Supplement (CPS ASEC), which is undertaken each Spring. This survey has a smaller sample size than the ACS, which is fine for national level estimates but which does not suffice for state by state breakdowns (as one needs when looking at Medicaid coverage by state). It also asks the somewhat different question of whether the individual had health insurance cover for the entire previous year, rather than on the date of the interview. The share of the US population without health insurance coverage fell sharply in 2014 and again in 2015. Using figures from the ACS, it had fluctuated modestly in the period from 2008 through 2013, rising from 14.6% of the population in 2008 to 15.5% as unemployment hit its peak in 2010, and then recovering slowly to 14.5% by 2013. It then dropped sharply to 11.7% in 2014 and to 9.4% in 2015. Critics of ObamaCare asserted at the start that the reforms did not and would not lead to more Americans being covered by health insurance. That was certainly not the case. By 2015, there were 20.7 million more Americans with health insurance cover than had it in 2013. This is far from minor, and can make an immense difference in a family’s life. The CPS ASEC figures also show a sharp drop in the share of the population without health insurance, with these figures quoted in many of the news reports one might see. With its differing definition of who is not covered (for the entire year, rather than on the date of the interview as in the ACS), the shares are somewhat lower, at 9.1% in 2015. It fell from a 13.3% share in 2013 and a 10.4% share in 2014 in these estimates of the share of the population who did not have health insurance over the entire year. By whichever measure, health insurance cover expanded sharply once the ObamaCare reforms entered into effect. By the ACS measure, the share of the population without health insurance fell from 14.5% of the population in 2013 to 9.4% two years later, or by 5.1% points. It can be expected to fall further, although not to zero. Certain groups in the population (including certain immigrant groups) are not eligible for purchasing insurance through the ObamaCare market exchanges, and thus the non-insured rate will never go to zero. While the floor is not certain, many analysts set the figure at perhaps 4 or 5% of the population. If so, then the improvement seen so far is approximately half of what might ultimately be achievable, provided politically imposed roadblocks are all removed. The chart also shows the shares of the population without health insurance separately for the states that expanded Medicaid coverage (supported by the ACA and an integral part of it) and those that did not. The system as designed under the ACA has that the working poor and lower income classes would obtain health insurance under Medicaid, with eligibility expanded from those with income up to generally 100% of the federal poverty line previously, to 133% from 2014 onwards. Those with incomes higher than this would purchase insurance from the market exchanges, with a subsidy that phases out as incomes grow and is phased out entirely at 400% of the federal poverty line. Thus the entire population, no matter how poor, would be able to obtain health insurance. However, the Supreme Court decided that Medicaid expansion could not be made obligatory on the states even if the federal government is paying for it (as it is here). Rather, the states could choose whether or not to allow Medicaid to expand cover to include those making up to 133% of the federal poverty line. It would be financially foolish for the states not to, as the federal government would cover 100% of the cost of the expanded coverage in the first several years, with this then phasing down to 90% of the additional cost from 2020 onwards. But even with the states covering 10% of the cost from 2020, a net gain can be expected for the state budget due to the increased incomes of hospitals, doctors, nurses, and other health car suppliers who would now be providing care to the poor when they need it (and be compensated for it), and the state tax revenues that would be generated by such higher incomes. The states would also save by being able to reduce state payments made to cover a portion of the costs incurred by hospitals to provide health services to patients who were not able to pay for their treatments, due to a lack of health insurance. Despite this, 23 states (as of January 2015) decided that the low income earners in their states would not be allowed to receive health insurance cover from Medicaid. Note that these families must indeed be working to be able to have an income of 100% of the federal poverty line (of $24,300 in 2016 for a household of four). Assuming one wage earner, working 40 hours a week for 52 weeks a year (no vacations), they would need to earn a wage of $11.68 per hour to earn this much, or well above the minimum wage of $7.25 per hour. More likely there would be two income earners in such a household, each earning a wage rate of closer to the minimum wage, but likely not able to obtain full time employment of 40 hours a week for 52 weeks a year. These households are not slackers, but rather are working hard to get by. Yet these states are refusing to allow such households to obtain health insurance cover from Medicaid, despite a net financial benefit to their state budgets. And since the Affordable Care Act was structured that such families would obtain health insurance coverage from Medicaid, and not purchased (with a partial subsidy assistance) through the health insurance market exchanges, they are now left with nothing. These states have deliberately created a gap where their low income workers are effectively denied access to health insurance. The reason these states have done this is of course political. The 23 states (as of January 1, 2015) that had not permitted Medicaid to expand were states with Republican governors or Republican legislatures (or mostly both) that refused to allow Medicaid in their states to serve such families. And as noted above, this was done even at financial cost to themselves. Nebulous arguments were given that while the federal government would be paying for most or all of the costs in the near term, the federal government might reverse this later, due perhaps to budget pressures. But there is no reason why such a reversal should be expected, nor why, if there were indeed such budget pressures, it would apply to Medicaid but not to other federally funded programs that those states are taking advantage of. Furthermore, if this did indeed happen at some uncertain point in the future, the Medicaid programs in the state could be cut then, rather than now in anticipation that this might somehow happen at some unknown point in the unknown future. 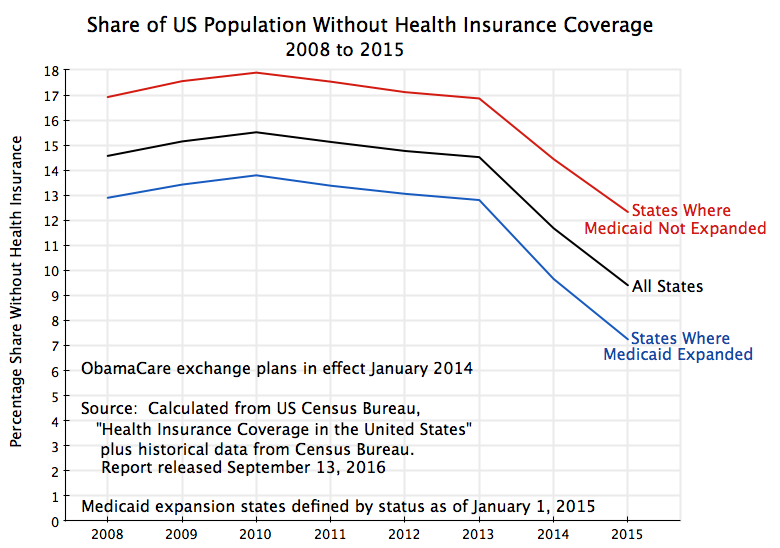 As shown in the chart at the top of this post, the share of the population without health insurance cover fell to just 7.2% in 2015 in the 27 states (plus Washington, DC) that allowed Medicaid to expand, far below the 12.3% in those states that blocked that expansion. Compared to 2013, before the ObamaCare reforms went into effect, this was a reduction of 5.6% points in the states that allowed Medicaid to expand, versus a reduction of 4.5% points in the states where the expansion was blocked. Put another way, the share of the population without health insurance fell by 43% in the states that allowed Medicaid to expand, versus a fall of just 27% in the states that blocked it. Furthermore, the far better improvement in the Medicaid expansion states was from a lower starting point in 2013 (of 12.8% of their population without health insurance, versus 16.7% in the states blocking Medicaid expansion). One should expect that improvement becomes more difficult as one comes closer to the achievable ceiling in coverage. But the chart also serves to show that the states blocking Medicaid expansion historically had a high share of their populations without health insurance. These were conservative states, often relatively poor, with political establishments that did not exhibit great concern over the fact that a high share of their population could not get health insurance. But not all were poor. Indeed, the state with the absolute worst share of any state was oil-rich Texas, with 22.1% of its population without health insurance in 2013, and still 17.1% without it in 2015 (where both figures were the highest in the US in the respective years). Out of 50 states (plus Washington, DC), Texas was the worst. This was a political choice, not an economic one. It should also be noted that the reduction in the shares of uninsured in those states that allowed Medicaid to expand was not due solely to the increased number of Medicaid enrollees. Between 2013 and 2015, those states saw 12.2 million of their citizens obtain health insurance cover. Of these, 7.6 million came from increased enrollment under Medicaid, while 4.5 million came from other health insurance cover (including through the ObamaCare market exchanges). And as noted above, they were starting from a point where a relatively high share of their citizens (compared to the states where Medicaid expansion was blocked) enjoyed some form of health insurance cover previously. There is also an interesting finding that the states that allowed Medicaid to expand not only saw greater improvements in the shares of their citizens who enjoyed health insurance cover, but also saw insurance premiums on their ObamaCare exchanges (as of 2016) which were lower than comparable company-sponsored plans in those states. A recent study by the Urban Institute (a non-profit think tank) found that for similar health insurance cover, the full prices (before subsidies) of health insurance purchased through the ObamaCare exchanges were 10% lower on average (at the national level), than the full prices of similar health insurance plans provided through employers. The calculations were made state by state, as costs varied by state, and varied widely. But on average, the ObamaCare plans cost 10% less. This may be come as a surprise to many. The issue is that most employees do not know what the full cost of their company-sponsored health insurance plans in fact is. The full cost includes not only what they pay directly, but also what they pay indirectly through the employer (which they typically never see) as part of their overall labor compensation package. But it is part of their wages and a cost that must be covered. The unweight average lower cost of the ObamaCare plans was 8% nationally. This is different from the 10% figure the Urban Institute cited because the lower costs were especially large in some of the larger states, such as New York, Illinois, Pennsylvania, Michigan, and Ohio (all of which had lower costs of 18% or more). In the unweighted averages, these larger states are weighted the same as smaller states. But what is especially interesting is that the (unweighted) average lower cost of the ObamaCare plans compared to company based plans was 15% in the states that approved Medicaid expansion but was no different on average in the states that blocked Medicaid expansion. Why would this be? It was probably not due to the Medicaid expansion itself. One would expect Medicaid expansion would lead to lower health insurance costs for those obtaining health insurance. The reason is that hospitals and other health service providers will have lower costs due to less uncompensated care of patients without health insurance coverage (as more would have Medicaid coverage), and one can expect that these lower costs would then be reflected in lower health insurance costs for those who do pay. However, this should affect health insurance costs of policies purchased through the ObamaCare exchanges and company-based policies similarly, and hence would not likely affect the ratio in cost between the two. However, the Medicaid expansion states were also the ones that encouraged competitive ObamaCare market exchanges to be established. They did not seek to block these markets or keep them from functioning well. They encouraged competition rather than did whatever they could to hinder it. It was likely due to this greater degree of competition in those states that supported, rather than hindered, the ObamaCare exchanges that explains the lower costs in those states. This is also consistent with the fact noted above that many of the larger states saw especially low costs (relative to company-based plans) than were observed among the relatively smaller states. The larger states will in general see greater competition, and competition drives down prices. One can no longer dispute that ObamaCare has succeeded in its primary goal of making it possible for a higher share of the population to obtain the security of health insurance coverage. But this certainly does not mean there are no issues with ObamaCare. Republicans openly acknowledge that they continue to do whatever they can to block the expansion of access to health insurance under ObamaCare. And these efforts to hinder ObamaCare have achieved some success. As noted above, states that blocked Medicaid expansion have seen less of a reduction in their uninsured populations than was achieved in the states that allowed that expansion. But the efforts to block access to ObamaCare went beyond blocking Medicaid. Most of these states also decided not to implement directly the ObamaCare market exchanges in their states. The Affordable Care Act envisioned that to best allow local control and adaptation to a state’s particular circumstances, state level authorities would be allowed and indeed encouraged to establish such exchanges. Fortunately, the law also included a back-up provision that should a state choose not to establish such an exchange, the federal government could do it to allow the citizens of that state access to an affordable health insurance plan. This was not without difficulties; recall the initial failure of the federal level computer systems when enrollment opened in October 2013 and the system was overwhelmed. More recently, several of the larger health insurers have decided to withdraw from some of the markets in which they had previously offered health insurance plans on the ObamaCare market exchanges. Most recently, Aetna announced in August that it would withdraw in 2017 from 11 of the 15 states where it had been offering such plans. This followed earlier announcements by UnitedHealth and Humana that they also would be scaling back offerings significantly. This will reduce competition among the insurers in a number of markets around the country, limiting the options enrollees in those markets will have. Indeed, in some counties around the country there will be only one insurer offering coverage through the exchanges, and (unless something is now done) one county in Arizona where there will be no such insurer offering coverage through the exchanges. The issues could certainly be addressed, if there is the will. All major new social programs, including Medicare and Social Security were fine-tuned through new legislation following their launch to address issues that developed. And this was done on a bipartisan basis. The problem now is that the Republican Party, for political reasons, is doing what it can to block any such adjustments, with the openly stated aim of trying to destroy ObamaCare. It is still to be seen whether these efforts will succeed. If they do, the US will revert to its previous system, with millions of Americans denied access to health insurance and with sharply rising health care costs that outpaced general inflation for decades. This entry was posted in Health Reform and tagged health reform, policy, US politics by aneconomicsense. Bookmark the permalink.